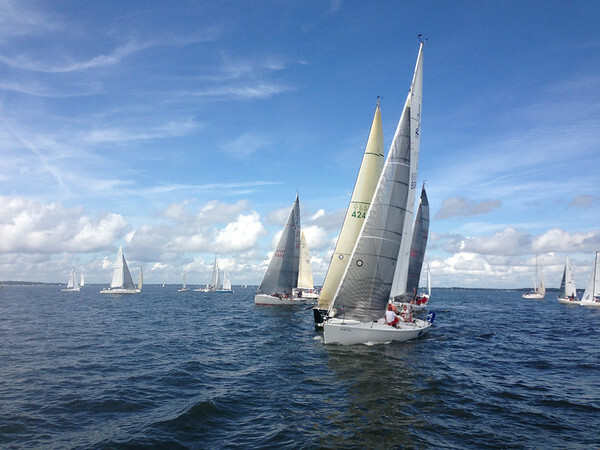 This weekend I sailed aboard Wavelength in the the Southern Bay Leukemia Cup Regatta. On Saturday we started with a postponement while few storms moved through the area. An hour later it cleared up and the wind continued to build throughout the day. We started out with a new No 1 Genoa and we liked the way it was working and how we were able to point. We did well in the first race, had good crew work and maneuvers and finished 4th. While we were beating a couple faster boats on the water, we were just not able to reel in Afterthought, Double Eagle and Voodoo to be able to correct over them. By the 2nd race of the day the wind picked up and we switched down to the 2. Just after starting the wind dropped down for a short time before the sea breeze really started to crank. By the 2nd downwind we were seeing winds in the low to mid 20’s and along with a few other boats – we elected not to fly a spinnaker. We had a 4 & 5 on the day to keep us in 4th. The party was fun and the live charity auction featured one of my prints that raised some money for the Leukemia & Lymphoma Society. On Sunday we pretty much just had light air all day. We did two races and sailed well, but still weren’t really able to reel in the 3 boats at the head of the pack. All in all it was a another fun weekend of sailing with the Wavelength team! Thanks Rob & Steve for having me and if anyone would like to donate to our fundraising effort this link can be used. Results.